Halloween is nearly here, and with it comes loads of scares and sweets. If you have a sweet tooth but still like to be mostly health conscious this All Hallows’ Eve, then you’ll want to stay on top of what you and your kids are eating. Ever want to know what popular Halloween candies are “healthier” than others? 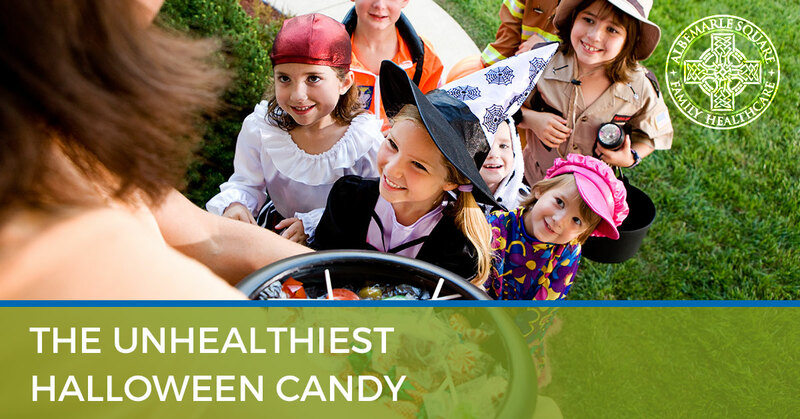 Well, the health experts at Albemarle Square Family Health Center have the perfect blog to help you find the perfect candy to satisfy that sweet tooth. Here we’ll rank the most popular Halloween candies, starting with the unhealthiest candy in this blog then moving to the healthiest Halloween candy in part two. Make sure to stay tuned next week to find out what the healthier Halloween candies are. But without further adieu, let’s dive into the candy bowl and see which popular candies you should avoid or limit this Halloween. The fifth worst popular Halloween candy is Almond Joy. Due to its high sugar content, Almond Joy ranks among the top five unhealthiest Halloween candies sold in the United States. The coconut candy also boasts high fat content as well, which only adds to the woes brought on by the high sugar levels. Milk chocolate, which is higher in sugar and fat content, covers the coconut center, which is sweetened to allow more people to like the taste of coconut. Almond Joy does have some redeemable qualities, however. Though it’s high in fat, most of the fat is healthy unsaturated fat thanks mostly to the coconut and almond in every piece. Crunch bars are one of the oldest chocolate bars in the United States, first introduced in 1938. The traditional crunchie chocolate bars are made with milk chocolate and puffed rice. Crunch bars are one of the highest calorie Halloween candy bars, despite only having two main attributes: chocolate and crunch. The popular candy has been a mainstay in Halloween and goodie bags for decades, but doesn’t offer much in the form of nutritional value, unfortunately. If you or your kids love Crunch bars, consider limiting them this Halloween. M&M’s have been around since 1941 and as such have graced many a Halloween candy haul. These popular little chocolate morsels coined the term “Melt in your mouth, not in your hand”. They are, unfortunately, very high in sugar and fat. Though they have fewer calories than that of the Crunch bar, Peanut M&M’s come in higher numbers, often tricking you into eating more than other candies. Though it does contain peanuts, allergy sufferers beware, each piece contains more empty calories than it does helpful ones. Fun fact with Peanut M&M’s, the original creator of the candy was actually allergic to peanuts. “Not Reese’s”, many people are probably shouting right now. Unfortunately yes, Reese’s peanut butter cups are some of the worst candies you can have this Halloween season. Mostly due to their high concentrations of sugar, thanks mostly to the milk chocolate and candied peanut butter, Reese’s cups are also high in fat due to the pureed peanut center. Like Almond Joys, Reese’s do contain healthy fats, but their calorie counts are astronomical compared to other candies on this and the next list. A single cup, which is usually the “Fun Size” Halloween servings, contain nearly 90 calories. Tasty and an American candy staple since the 1930’s, but you may want to limit yourself on the peanut butter cups this Halloween. Yes, the unhealthiest candy on our list is one of the most popular candies in the United States. It doesn’t matter what team you’re on, both left and right sides have high sugar, fat, and calorie counts thanks to the milk chocolate, caramel, and cookie center. In fact, they have the highest amounts of all calories and fat of any “Fun Size” Halloween candy sold in the United States. They may be incredibly delicious, but Twix bars are some of the worst candy bars your kids may get trick-r-treating this Halloween. We hope this blog has helped you identify some of the worst candies come this Halloween. If your little ghoul or goblin has too many sweets this Halloween, or you just need to see a pediatrician in Charlottesville, then the medical professionals at Albemarle Square are ready to help. Learn more about Albemarle, view our expert staff, from the doctors to the front office, or contact Albemarle Square Family Health to book your next appointment. Remember to watch out for part two of our Halloween blog series to find out what Halloween candies are the healthiest.